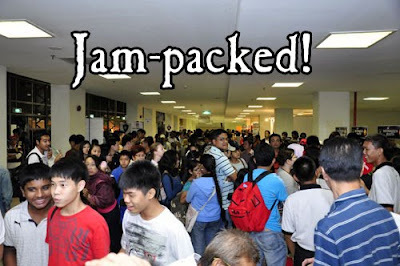 This was how the crowd looked like yesterday evening. However, in the end, no autograph session took place. 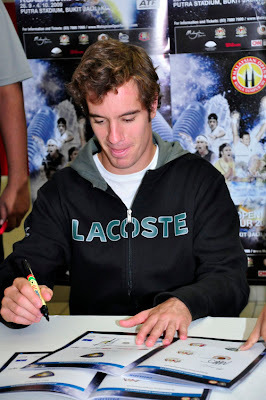 The best time for tennis fans to meet their favourite players and get their signatures is during the weekdays. Due to assignment on other places, I only get to attend two autograph sessions organised for Richard Gasquet and Mikhail Youzhny. 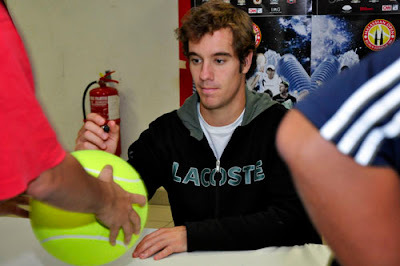 Gasquet during autograph session after he beat Pim Pim in the second round. How to meet Fernando Verdasco - the little boy was crying when he wasn’t able to catch a shirt that Verdasco had thrown into the stands. So he was brought on court to meet the tennis star. I had to give Richard Gasquet presser a miss to take these gems. I knew Feliciano Lopez had a new haircut on Tuesday so I headed to court 1 to see him practice with Fernando Verdasco hoping to snap some pictures of his famous blond locks. How do you like his short hair? 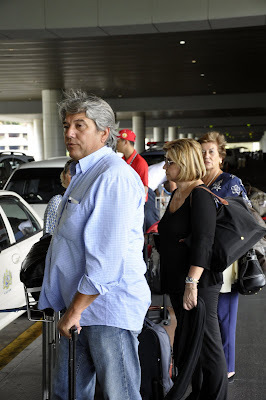 Insider source said that Gonzalez requested for a golf session yesterday. The ATP 250 PROTON Malaysian Open hasn't end but HCFoo's Tennis Blog has officially named Joachim "Pim Pim" Johansson, Mr Congeniality for the year 2009. Not only that I've seen him practice with Rendy Lu Yen-hsun earlier this week, the Swede wild card recipient and former top 10 player also partnered with Malaysian wild card Si Yew Ming in the doubles event yesterday. However, his bids in the singles and doubles events came to an end after he was defeated by Richard Gasquet 6-4, 6-7, 2-6 and by Brazilians Marcelo Melo-Andre Sa 1-6, 7-5, 3-10. I managed to chase Pim Pim down after his practice. 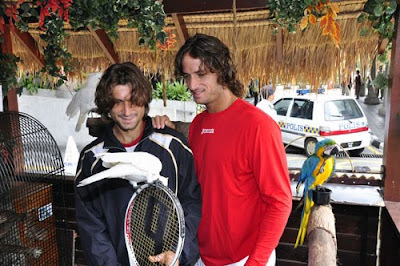 I've got to say that he's the most humble (the other player is Rafael Nadal) and nicest guy I've met on tour. 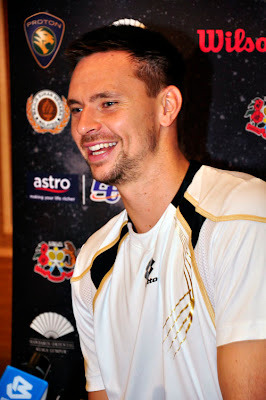 I've been neglecting other tournaments lately to provide exclusive coverage on the Malaysian Open. 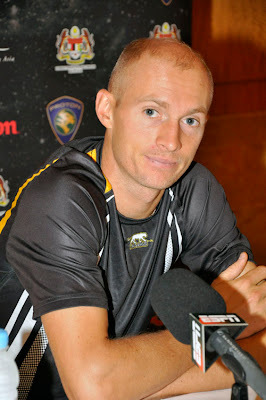 So here's a little bit of updates regarding the PTT Thailand Open. 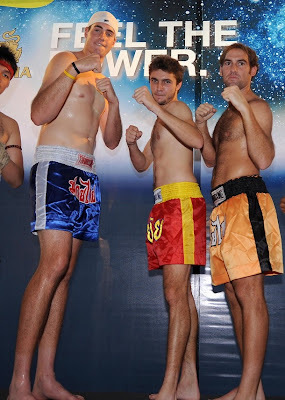 Gilles Simon, Robby Ginepri and John Isner attended a promotional/traditional event for the tournament yesterday. 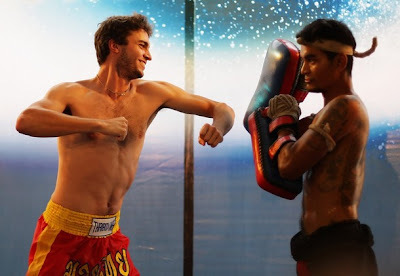 They did a Muay Thai (Thai kickboxing) demonstration guided by Thai Olympian Somjit Jongjorhor. Jo-Wilfried Tsonga did the same thing last year. Here are more pictures at the event. By the way, if you haven't know yet, Sam Querrey had a freak accident earlier this week while practicing for the Thailand Open. Querrey was said to have sat on a glass table after practice on Monday and fell through, cutting his right forearm. The injury required immediate emergency surgery. 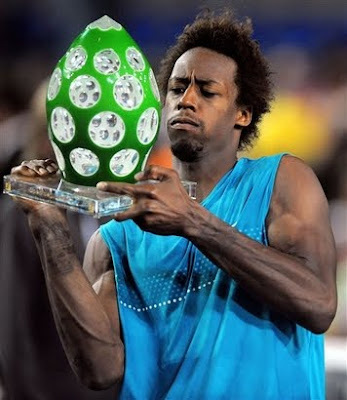 Monfils said he wasn't comfortable with the new hairdo so he had to put the cap on. Hope that solves the mystery. 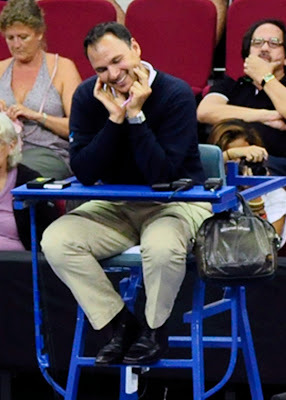 A lot of tennis fans have been asking about this since Monday. Finally the schedule for Proton Malaysian Open, Kuala Lumpur 2009 on Astro SuperSports Channel 816 is out! 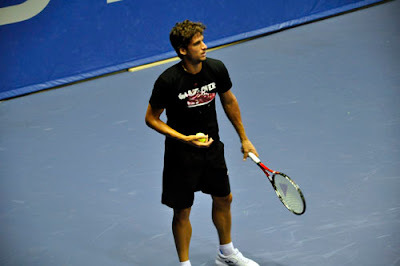 If you want to experience LIVE tennis, I have some Friday evening session tickets to giveaway. I just need you to write down ANY comment and leave your email address so that I can contact you. Limited tickets available, so be fast. 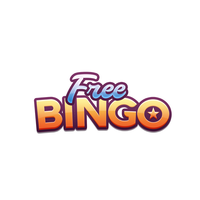 You could be walking away with a Proton Satria Neo that night too! You need to collect the tickets from me at the stadium on Friday before the matches. Thanks to the organiser of the Malaysian Open for reserving those tickets for us as tickets are almost sold out for Friday and weekend matches. For those outside of Malaysia, you can watch live streaming at atdhe.net. 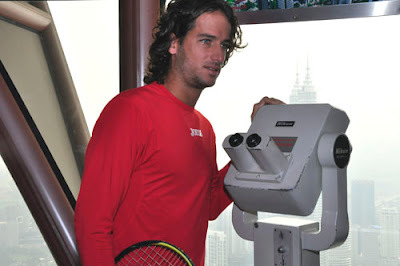 Both Feliciano Lopez and Fernando Verdasco seem to share a common habit. They like to send text messages in between photo shoots. 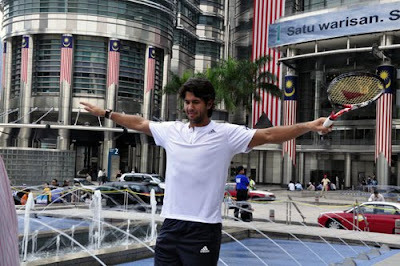 During his photo shoot at KLCC, Verdasco also took pictures of the magnificent-looking twin towers with his cell phone. 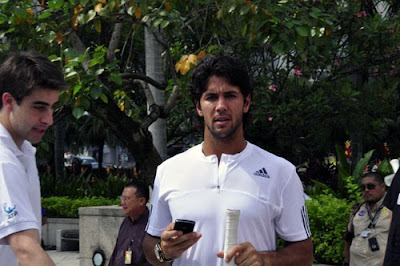 If you have been following my tweet, you would definitely know how I screw up my first meeting with Fernando Verdasco. I was so starstruck upon seeing the Madrid twins (Verdasco and Feliciano Lopez) at the airport and I mistakenly called Verdasco 'Feli'! You have no idea how embarrassing that was! 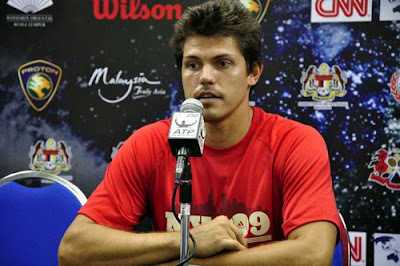 Today I had the opportunity to apologise to Verdasco and even get to interview him personally. 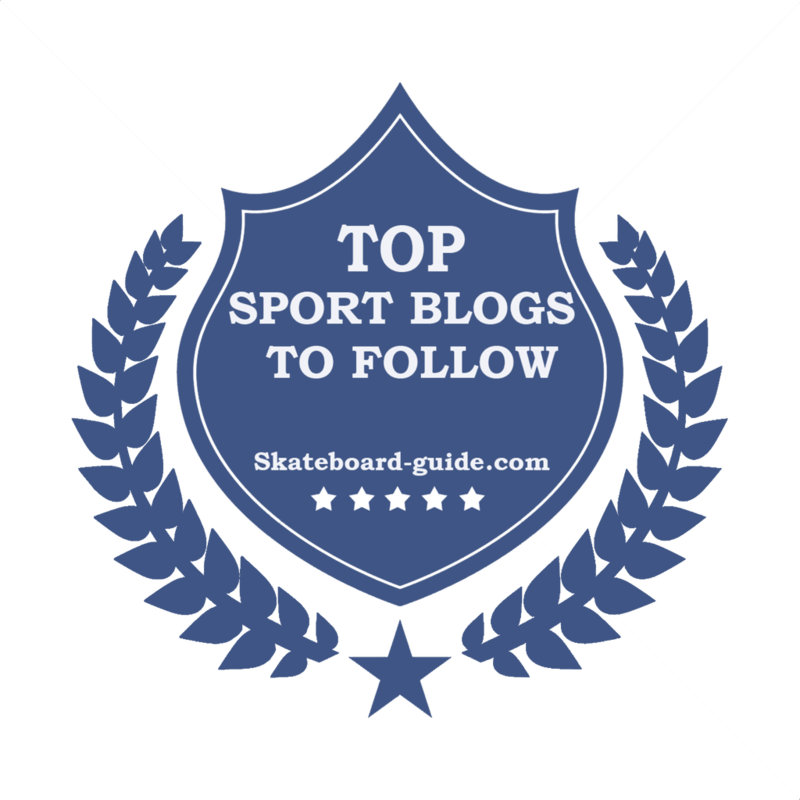 Thanks to @piratesswoop for providing a couple of questions. In this interview, you will get the answers directly from Verdasco regarding his delayed foot surgery, his abs injury, FeVer clothing line, long-awaited official website, etc. I'll be attending the evening session matches at the PROTON Malaysian Open tonight. I'm extremely excited about this as the tournament has one of the fastest tennis court surface. 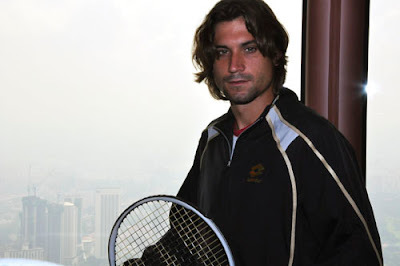 Wild cards recipients Taylor Dent and Marcos Baghdatis will begin their first round match at 5PM. Dent will face Andrey Golubev first and followed by Baghdatis against Rendy Lu Yen-hsun. 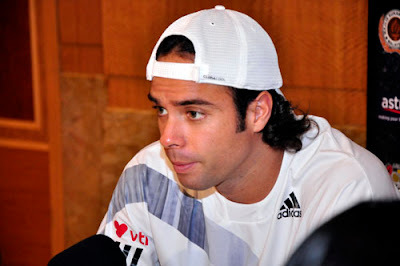 I attended the pressers held for Dent and Baghdatis yesterday. Dent was super confident of his chance and said he was 100% fit. 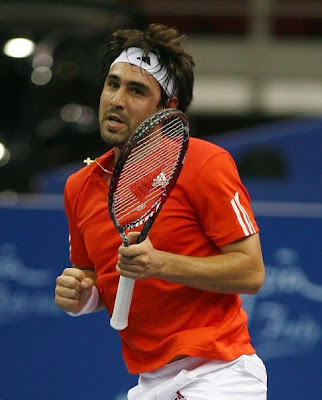 Meanwhile, it didn't look too good for Baghdatis who refused to think much about his opponent. 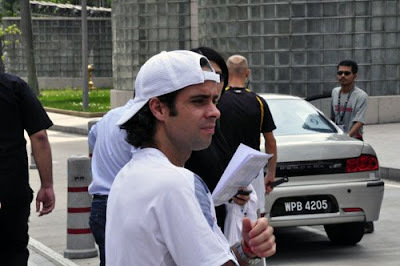 Earlier I was at the practice court and saw Rendy practicing with another wild card Joachim "Pim Pim" Johansson. I asked Rendy to comment about his first round match against Baghdatis (they never play each other before) after his practice. 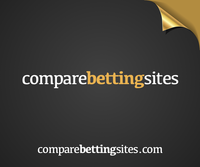 So check out this video. Gael Monfils the fifth seed at the Proton Malaysian Open Kuala Lumpur 2009 is heading here soon after having just won his first tournament of the year. Monfils ended a four-year title drought by defeating Philip Kohlschreiber 7-6, 3-6, 6-2 in the final of the Open de Moselle in Metz, France. “I am very happy about winning this second title; I've been waiting for it for a long time. Being in France, this title is even more special to me, as I won it here in front of my family and friends. 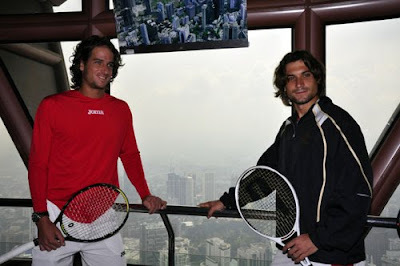 David Ferrer and Feliciano Lopez were at the top of the KL Tower this morning for a photo shoot session to promote the PROTON Malaysian Open tennis tournament. It was kind of hazy so the photos that we've got weren't that impressive. 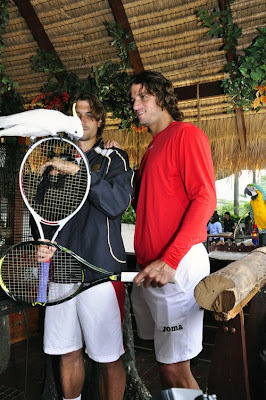 Then, we came down for another photo shoot session, this time the Armada boys posed with a parrot. It was kind of fun. Here's the pictures and video. 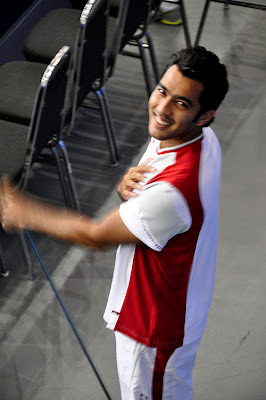 Qureshi may have lost in the qualie but he won with that smile! Brendan Evans, Mikhail Kukushkin, Michael Yani and Rohan Bopanna made it into the Main Draw at the PROTON Malaysian Open today. Here' the complete results and OOP for tomorrow.